Note: For analysis of health insurance coverage, see Decline in employer-sponsored health coverage, by Elise Gould, director of health policy research at EPI. This morning’s release by the U.S. Census Bureau of the 2009 poverty and income data was yet another reminder of the severity of the Great Recession that began in December 2007. The data show that the poverty rate increased from 13.2% in 2008 to 14.3% in 2009, the highest rate since 1994. Furthermore, for the first time on record, the nominal (non-inflation adjusted) income of the median, or typical, household actually fell, from $50,303 in 2008 to $49,777 in 2009. Inflation was negative from 2008 to 2009, dropping by 0.4%, so real (inflation-adjusted) income did slightly better, dropping $335, or -0.7%, from $50,112 in 2008 to $49,777 in 2009. When unemployment skyrockets and job seekers cannot find work, incomes fall and poverty rises. The fact that the deterioration in both poverty and income from 2008 to 2009 were so dramatic is unsurprising given the deterioration in the labor market. Figure A shows that the unemployment rate increased from 5.8% to 9.3% from 2008 to 2009, a 3.5 percentage point increase. This is by far the largest one-year increase on record (these data go back to 1948; the second largest increase was a 2.9 percentage point increase from 5.6% in 1974 to 8.5% in 1975). When we look back on this whole period, we will likely find that the Great Recession that began in December 2007 caused the unemployment rate to rise for four years, from 2007-11. However, the increase from 2008 to 2009, which is what today’s data release covers, captures the big collapse in the American economy. The poverty rate increased from 13.2% to 14.3% between 2008 and 2009, representing an additional 3.7 million people living in poverty for a total of 43.6 million in poverty in 2009. The poverty rate for children was 20.7% in 2009, representing 15.5 million kids living in poverty. In 2009, over one-third (35.5%) of all people living in poverty were children. The poverty rate for working-age people (18-64 years old) hit 12.9% in 2009, the highest rate in nearly 50 years. The elderly (65 and older) population saw a -0.8 percentage point decrease to 8.9% in 2009, the lowest elderly poverty rate on record. Social Security provides seniors with an income that insulates them against severe economic downturns like the Great Recession. Although significant increases in poverty were felt from 2007 to 2008, it was only the tip of the iceberg. While no single group was spared, white non-Hispanics maintained far lower rates. Hispanics and Asians were particularly hard-hit by increases in poverty in this recession, increasing 3.8 and 2.3 percentage points from 2007-09. The poor are getting poorer. In 2009, the share of the population below half the poverty line hit a record high of 6.3%. In 2009, over one-third of black children (35.7%) and nearly one-third Hispanic children (33.1%) were living in poverty. Families (with children) headed by single mothers hit 38.5% in 2009. Of the 6.6 million families living in poverty, 3.8 million of them were headed by a single mom. The poverty threshold decreased, from $22,025 for a family of four in 2008 to $21,954 in 2009. In the five decades that this measure has existed, 2009 is the first time that the threshold has ever decreased. For the first time on record, the nominal (non-inflation adjusted) income of the median, or typical, household actually fell, from $50,303 in 2008 to $49,777 in 2009. Inflation was negative from 2008 to 2009, dropping by 0.4%, so real (inflation-adjusted) income did slightly better. Real median income declined by $335 from $50,112 in 2008 to $49,777 in 2009, a decline of 0.7%. The real median income of working-age households declined even more, falling by $754 from $56,575 to $55,821. African Americans were hit particularly hard in 2009, with the median African American household income dropping by 4.4%. The 2009 data show that inequality increased slightly with higher incomes recovering disproportionally in the second year of the recession. In 2009, workers at the 20th percentile saw a decline in income of 0.9%, while workers at the 95th percentile saw an increase of 0.4%. Real earnings for the median full-time, full-year female worker rose 1.9% in 2009, from $35,609 to $36,278, while the median male working full-time, full year saw an increase of 2.0%, from $46,191 to $47,127. Particularly astonishing was the 4.7 million drop in the number of earners working full-time full-year. The job loss and hours reductions of 2009 meant there was a 3.7 million drop in the overall number of workers with any earnings at all in 2009, and a 1.1 million increase in the number of workers working part-time and/or part-year. Between 2008 and 2009, an additional ­­­­­­3.7 million people slipped below the poverty line, as the poverty rate increased from 13.2% to 14.3%, the highest rate since 1994. The poverty rate for children, at 20.7% in 2009, was higher than the overall rate and increased more (by 1.7 percentage points) from 2008. The 2009 rate represents 15.5 million kids living in poverty. In 2009, 35.5% of all people living in poverty were children. 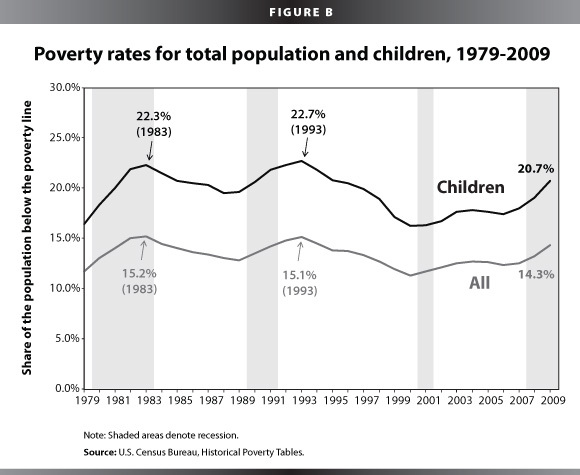 Figure B shows the poverty rate over the last 30 years, both overall and for children. Much of the decline in poverty achieved during the business cycle of the 1990s has now been reversed. Overall poverty declined by 1.5 percentage points, and child poverty dropped by 3.4 percentage points from 1989 to 2000. From 2000 to 2009, however, poverty increased overall by 3.0 percentage points, and by 4.5 percentage points among children. The large increase in poverty suggests that as anti-poverty policies have come to depend more on paid work as the main pathway out of poverty, the safety net has become less effective in reducing economic hardship when the economy and job market are underperforming. The deepening recession took the hardest toll on working age people, 18-64 years old, where poverty increased by 1.2 percentage points from 2008 to 2009, tied (with 1979) for the largest single-year increase on record. As shown in Figure C, the poverty rate for working-age adults hit 12.9% in 2009, the highest in nearly 50 years. 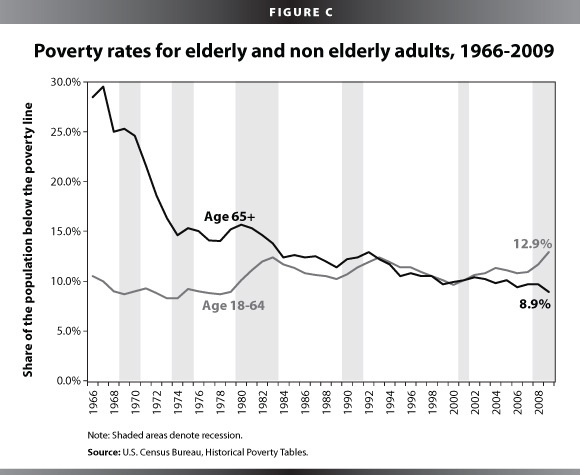 Over the same five decades, the poverty rate for those over 65 years old has dropped precipitously, due in part to Social Security payments, which have effectively lifted millions of elderly Americans out of poverty. In 2009 alone, the rate dropped 0.8 percentage points to 8.9%, an all-time low, aided by a boost in Social Security payments as part of the Recovery Act. Figure D displays the share of the population below half the poverty line (in 2009, 50% of the poverty line for a family of four was $10,977) from 1975-2009. This measure tracks the depth of poverty, those living on half the subsistence rate. In 2009, 6.3% of people were living below this line, up 0.6 percentage points since 2008 and reaching a record high, meaning that we have not seen such a high share of the population in deep poverty since we began tracking this population in 1975. Poverty rates and changes in those rates have varied across racial and ethnic groups, with blacks and Hispanics being particularly hard-hit by increases in poverty in 2009. White non-Hispanics experienced the lowest rates of poverty at 9.4%, while the rates for blacks and Hispanics were more than two-and-a-half times higher at 25.8% and 25.3%, respectively. 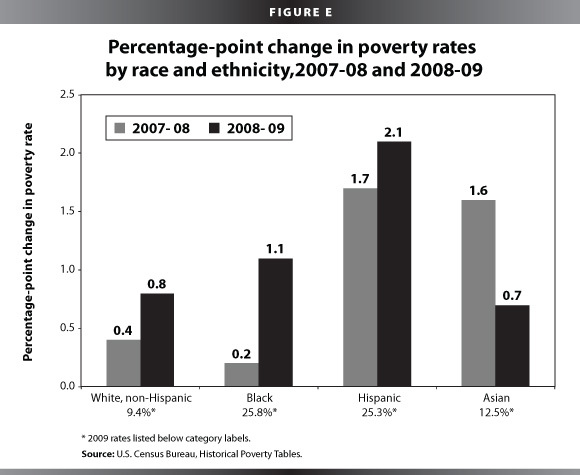 Figure E shows percentage-point changes in the poverty rate for various racial and ethnic groups in the 2007-08 and 2008-09 periods. The effects of the first year of the recession on poverty rates were only the tip of the iceberg. Between 2008 and 2009, poverty rates increased more than the previous year for every group except Asians. 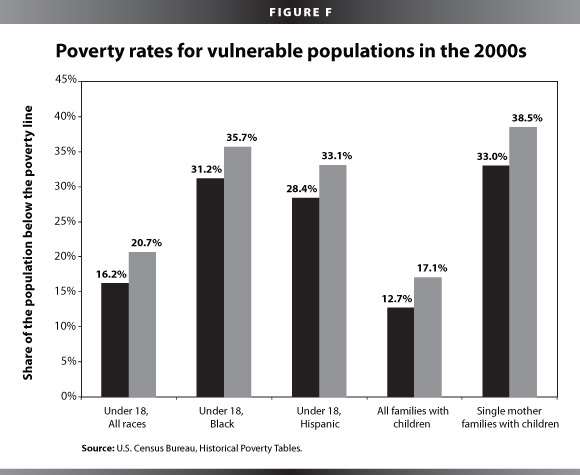 Black and Hispanic poverty rates increased by 1.1 and 2.1 percentage points, respectively, from 2008 to 2009. The 2000s have all but erased any gains to reducing poverty in the 1990s. This recession has only exacerbated the damaging trends over the last decade, leaving some of the most vulnerable populations with large shares living below the poverty line. Figure F shows changes over time in poverty rates for particularly vulnerable populations—children, racial and ethnic minority children, and single mother families. From 2000 to 2009, black children experienced a 4.5 percentage-point increase in poverty to 35.7%. Hispanic children experienced an increase of 4.7 percentage points over the same period to 33.1%. For families headed by single mothers, there was a 5.5 percentage point jump from 2000 to 2009 to 38.5%. In 2009, of the 6.6 million families living in poverty, 3.8 million of them were headed by single moms. While the largest increase in the unemployment rate in this recession was experienced between 2008 and 2009, it is expected to rise in 2010 and 2011. Therefore, we still haven’t seen the full extent of the recession’s impact on poverty. We predict the poverty rate to increase to 14.5% in 2010 and could reach 14.6% in 2011. From 2008 to 2009, real median income declined by $335 from $50,112 to $49,777. This was a decline of 0.7%. The real median income of working-age households (where the householder is under 65 years old) declined even more, falling by $754 from $56,575 to $55,821, a decline of 1.3%. The fact that working-age households saw a larger decline is unsurprising, given that these are the households most affected by the deterioration of the labor market. Real earnings in this release were boosted by the lack of inflation in 2009. Inflation was -0.4% in 2009 due to a large drop in energy prices. Core inflation was at 1.7% over this period. If real incomes hadn’t gotten the boost from the drop in energy prices over this period, the declines in income would have been much more dramatic—for example, if inflation had been 1.7%, the income decline of the median working-age household, all else equal, would have been -2.7% instead of -0.7%. Figure G shows real median income over the last 30 years both for all households and, starting in 1994 when the data became available, for working-age households. A key point here is the comparison between business cycles. From 1979 to 1989, real median income grew $2,954, (from $45,325 to $48,279) and from 1989-2000, it grew $4,022, (from $48,279 to $52,301). But for the first time on record, over the business cycle from 2000-07, incomes did not rise, but fell slightly from $52,301 to $51,965. And with the weak labor market over this period, the real median income of working-age households fell significantly, from $60,746 to $58,495. This means that working families are weathering the current economic downturn on the heels of one of the worst economic expansions on record. 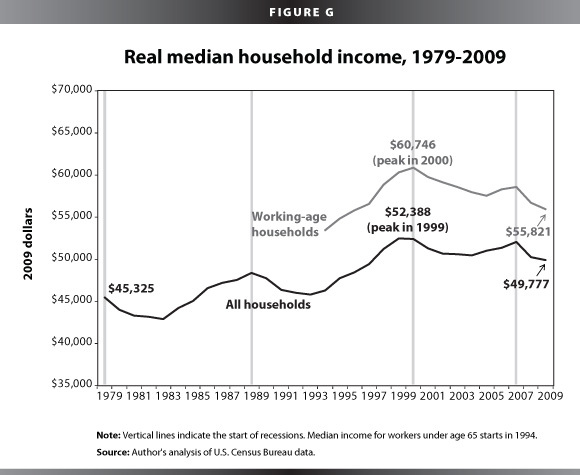 Real median income for working-age households is now $4,925 below its peak in the year 2000. Some racial and ethnic groups saw large declines in income in 2009, with African Americans getting hit particularly hard. 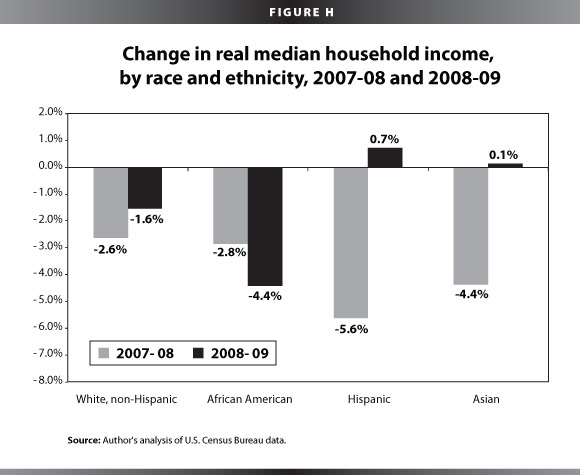 Figure H shows the percentage change in real median incomes for various racial and ethnic groups from 2007-08 and 2008-09. The median white non-Hispanic income declined by 1.6%, while African American households experienced a decline of 4.4%. The median Hispanic household increased slightly by 0.7% and the median Asian household also increased by 0.1%, though both of these groups saw particularly large declines in the first year of the recession, from 2007 to 2008. Table 1 shows that these changes represent substantial sums of money. For white non-Hispanics, the 4.1% decline since the start of the recession (2007-09) represents $2,353. Looking back further to include the weak business cycle from 2000-07, the losses are slightly greater—the median income of white non-Hispanics was $2,365 lower in 2009 than it was in 2000. For racial and ethnic minorities the losses were much larger—the median income of African Americans was $4,368 lower in 2009 than it was in 2000, while for Hispanics it was $3,273 lower, and for Asians it was $3,979 lower. The 2009 data show that inequality increased somewhat in 2009, with higher incomes recovering disproportionately in the second year of the recession. This is a change from the first year of the recession, when inequality, which had been on the rise since the early 1970s, did not increase as the recession hit people all across the income distribution. Figure I plots the percent change in real household income at various points along the income scale, from the 20th percentile (the point at which 20% of households have lower income and 80% have higher income) to the 95th percentile (where only 5% have higher income). In 2009, workers at the 20th percentile saw a 0.9% decline in income, whereas workers at the 95th percentile saw an increase of 0.4%. Today’s report also provides breakdowns in earnings (as opposed to income). The median male working full-time (35 hours or more per week) and full-year (at least 50 weeks, including paid time off) saw an increase in real earnings in 2009 of 2.0%, from $46,191 to $47,127, while the median female working full-time, full year saw an increase of 1.9%, from $35,609 to $36,278. Real earnings were boosted by the lack of inflation in 2009—for the median full-time, full-year worker, the nominal (not inflation-adjusted) increase in earnings was 1.1%—less than a quarter of the growth rate in the year before the recession, which was 4.8% from 2006 to 2007. Particularly astonishing was the 4.7 million drop in the number of earners working full-time, full-year. A disproportionate amount of this decline was among men—the number of men working full-time, full-year dropped by 3.8 million, while there was a 900,000 drop in the number of women working full-time, full-year. The job loss and hours reductions of 2009 meant there was a 3.7 million drop in the number of workers with any earnings at all in 2009, and a 1.1 million increase in the number of workers working part-time and/or part-year. The consequence of the eroded work-time for men was a slight drop in the annual inflation-adjusted earnings for the median male worker, from $36,429 to $36,331. The median female workers saw a slight increase, from $25,553 to $26,030. Figure J shows the real earnings of the median worker by gender since 1989. 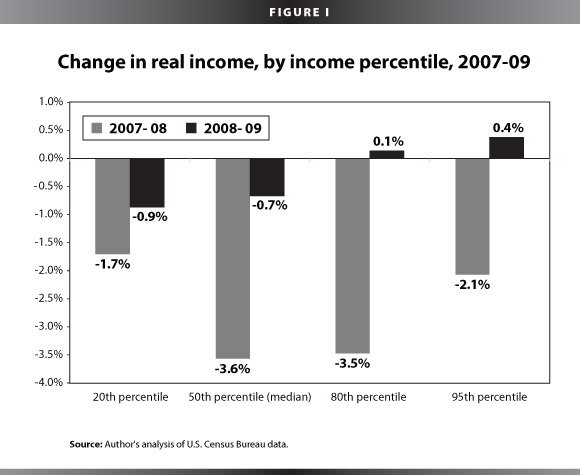 As mentioned above, the declines in income in 2009 capture the depth of the recession. 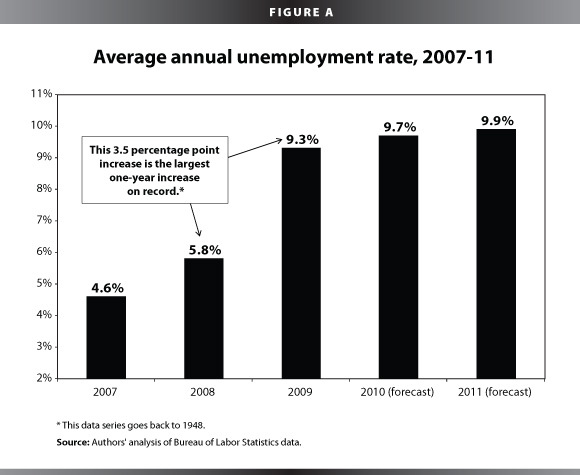 However, unemployment has increased from 2009 to 2010, and is projected to increase further in 2011. Therefore, it is likely that incomes will continue to decline in 2010 and 2011, though at a much slower pace. Based on unemployment projections for the rest of 2010 and 2011, along with the historical relationships between unemployment and income, we project changes in income for 2010 and 2011. These projections are given in Table 2. We find that the average income for the middle 20% of households will likely decline by $277 in 2010, and by an additional $138 in 2011, for a total decline of $2,572 from 2007 (the start of the recession) to 2011. This is a decline in income of 5.0%, or $2,572, for the typical household over these four years. Given the decline in income over the weak business cycle from 2000 to 2007, this means that after reaching an all-time peak in 2000, by 2011, real incomes for the typical household will likely have declined by 6.6%, or $3,485. How did the American Recovery and Reinvestment Act of 2009 (ARRA) affect today’s poverty and income numbers? First, it is important to note that ARRA passed in February 2009, began being implemented that spring and summer, and was in the process of ramping up through the end of the year. Thus, the full impact of ARRA was not felt until 2010. But even though the full effects of the Recovery Act are not reflected in the 2009 numbers released today, its positive impact can be seen. The primary impact of the Recovery Act is through the earnings workers received from the jobs created and saved by the stimulus, earnings these workers otherwise would not have had. The Congressional Budget Office estimates that the Recovery Act created or saved between 1.3 and 2.7 million full-time equivalent jobs by the end of 2009—without these jobs, the income declines and poverty increases described above would have been more dramatic. In other words, today’s report is ugly, but without ARRA, it would have been uglier. What about the direct income supports in ARRA? Three major income supports in the stimulus were unemployment insurance, nutritional assistance (food stamps), and tax cuts. Of these three, only unemployment insurance is counted in the income numbers released today. Today’s income numbers include cash income received from programs like unemployment insurance, but do not include noncash benefits like food stamps. Furthermore, income is measured before payments of taxes, so reductions in taxes are not reflected. While unemployment insurance is included in the calculation of income, the aggregated data released today do not allow very much to be said about its impact—that will require a more in-depth analysis of the microdata. However, we know that $28 billion was spent in 2009 on extended unemployment insurance benefits as a part of the Recovery Act. While unemployment insurance benefits replace a maximum of half of a worker’s prior earnings, these benefits nevertheless went exclusively to workers who were laid off through no fault of their own, and who had very low chances of quickly finding another job (in 2009, there were 5.6 unemployed workers per job opening on average). In other words, these unemployment benefits went to families who otherwise would likely have seen even steeper income declines, in some cases dropping below the poverty line. The labor market is the core building block of household incomes—when the labor market falters and people lose work, household incomes drop and poverty rises. Today’s report shows that the household income and anti-poverty gains made in the 1990s have been more than reversed due to both the weak business cycle from 2000-07 and the effects of the Great Recession that began in December 2007. While the Recovery Act stemmed the losses from the Great Recession, it was never big enough to right the economic ship given the scale of the crisis. With unemployment rising from 2009 to 2010 and expected to rise further in 2011, it is time for Congress to once again act boldly to create jobs so the people of this country have the work they need to provide for their families. Data were not collected for subpopulations between 1960 and 1965, but the rate of 17.0% for the 18-64 year-old population in 1959 suggests that the poverty rate in the early 1960s could have been higher than in 2009. Not a statistically significant change. Using the methodology described in Blank, Rebecca. 2009. “Economic Change and the Structure of Opportunity for Less-Skilled Workers.” Brookings Institute. Washington, D.C.
 Elasticities for changes in income given changes in unemployment are taken from Table 5.2 in Bartik, Timothy, Jobs for the Poor: Can Labor Demand Policies Help?, New York: Russell Sage Press, 2001. Congressional Budget Office. 2010. Estimated Impact of the American Recovery and Reinvestment Act on Employment and Economic Output from April 2010 Through June 2010. U.S. Government Printing Office: Washington, D.C. Table 1. Congressional Budget Office. 2010. The Budget and Economic Outlook: An Update. U.S. Government Printing Office: Washington, D.C. August. Box 1-2.